Jean le Rond d'Alembert (November 16, 1717 – October 29, 1783) was a French mathematician, mechanician, physicist and philosopher who believed that all truth could be derived from a single, ultimate, yet-to-be-discovered mathematical principle. He considered mathematics the ideal form of knowledge, and the laws of physics to be the fundamental principles of the world. D'Alembert was an important figure of the French Enlightenment and made contributions in physics, mathematics, philosophy, and literature. He was a rationalist and a materialist, believing the physical senses to be the most reliable source of knowledge about the universe. He was co-editor with Denis Diderot of the Encyclopédie, ou dictionnaire raisonné des sciences, des arts et des métiers, the original French encyclopedia, and contributed over one thousand articles on science and mathematics. 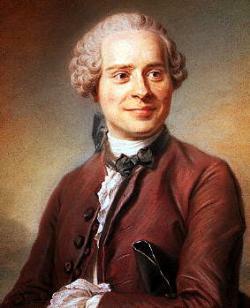 D'Alembert's method for the wave equation is named after him. Born in Paris on November 16, 1717, d'Alembert was the illegitimate child of the writer Claudine Guérin de Tencin and the chevalier Louis-Camus Destouches (an artillery officer). Soon after birth he was abandoned by his mother on the steps of the church of Saint-Jean-le-Rond de Paris. He was placed in an orphanage and, according to custom, named after the protecting saint of the church. Destouches, who had been abroad at the time of d'Alembert's birth, arranged for his adoption by the wife of a glazier and secretly paid for his education, but did not want his parentage officially recognized. On his death in 1726, Destouches left his son an annuity of 1200 livres. D'Alembert first attended a private school, and at the age of 12, with the assistance of the Destouches family, he entered the Jansenist Collège des Quatre-Nations (the institution was also known under the name Collège Mazarin). Here he studied philosophy, law, and art, graduating as bachelier in 1735. D'Alembert was first registered at the school under the name Daremberg, but later changed it to d'Alembert. The Collège des Quatre-Nations had an excellent mathematics library and the mathematics course, given by Professor Carron, was based on Varignon's lectures. The Jansenists steered D'Alembert toward an ecclesiastical career, but theology proved "rather unsubstantial fodder" for d'Alembert. He studied law for two years, and was nominated avocat in 1738. He also pursued his interest in medicine and mathematics. In July 1739 he made his first contribution to the field of mathematics, pointing out, in a communication addressed to the Académie des Sciences, the errors he had detected in L'analyse démontrée published in 1708 by Charles René Reynaud. At the time L'analyse démontrée was a standard work that d'Alembert himself had used to study the foundations of mathematics. In 1740, he submitted his second scientific work on fluid mechanics. In May 1741, after three unsuccessful applications, d'Alembert was admitted to the Paris Academy of Science, on the strength of these papers and his work on integral calculus. D'Alembert’s pugnacious and argumentative nature involved him in scientific and philosophical debates with many of his contemporaries. Until middle age he continued to live quietly at the home of his adopted mother, but in 1746 he was introduced to Mme. Geoffrin and invited to her salon, where he began to enjoy social success and popularity. When the Encyclopédie, ou dictionnaire raisonné des sciences, des arts et des métiers was organized in the late 1740s, d'Alembert was engaged as co-editor for mathematics and physical astronomy with Diderot, and served until a series of crises temporarily interrupted the publication in 1757. He authored over a thousand articles on physics, mathematics and science for the Encyclopédie, and wrote the preface for the first volume, which appeared in 1751. In 1747, d'Alembert published an article on vibrating strings which contained the first appearance of the wave equation in print. In 1747 he also received a prize from the Prussian Academy of Sciences for an article, Réflexions sur la cause générale des vents, which introduced the use of differential equations in physics. D'Alembert stopped publishing his mathematical articles during the 1750s because of conflicts with members of the Paris Academy and the Berlin Academy. Instead, he published them as a collection in Opuscules mathématiques, eight volumes which appeared between 1761 and 1780. Frederick II offered d’Alembert the presidency of the Berlin Academy in 1764, but he turned down this offer, and also an invitation from Catherine II to go to Russia as a tutor for her son. In his later life, d'Alembert turned his efforts to literature and philosophy. D'Alembert's philosophical works appear mainly in a five volume work, Mélanges de littérature et de philosophie, published between 1753 and 1767. D'Alembert was elected to the French Academy on November 28, 1754, and in 1772 he was elected perpetual secretary. D'Alembert was also a Latin scholar of some note and worked in the latter part of his life on a translation of Tacitus, which was widely praised by his contemporaries, including Denis Diderot. He suffered bad health for many years and died as the result of a bladder illness. A known unbeliever, d'Alembert was buried in a common unmarked grave. D'Alembert believed that mathematics was the ideal form of knowledge, and that physics was the basic science. He regarded mechanics as a part of mathematics, like algebra or geometry, based on certain necessary principles from which all phenomena could be deduced by the application of mathematical methods. Much of his work was done through mathematical deduction rather than through the collection and study of experimental evidence, a method which was criticized by his fellow scientists. In the preface to the Encyclopédie, Discours préliminaire de Encyclopédie, d'Alembert defended the physical senses as being a reliable source of knowledge about the universe. He was a strong rationalist, relying heavily on mathematics in his research. He believed that behind all truth was a single, ultimate, yet-to-be-discovered principle, and envisioned the achievement of universal scientific knowledge. Mélanges de littérature et de philosophie (1753-1767), d’Alembert’s major philosophic work, was a collection of essays previously presented before the Académie Français, some of which set out his skepticism concerning metaphysical problems. He accepted the existence of God, believing that intelligence cannot be a product of matter alone, but was strictly materialistic regarding the physical universe. The comments of his friends indicate that he was later influenced by Diderot in favor of materialism, and eventually considered himself an atheist. D'Alembert rejected the Cartesian principles he had been taught by the Jansenists: "physical premotion, innate ideas and the vortices." He made several contributions to mathematics, including a suggestion for a theory of limits. He was one of the first to appreciate the importance of functions, and defined the derivative of a function as the limit of a quotient of increments. From these ideas he developed a test for convergence, found in Volume 5 of Opuscules mathématiques, known today as d'Alembert's ratio test. In France, the fundamental theorem of algebra is known as the d'Alembert/Gauss theorem. In 1740, in his second scientific work on fluid mechanics, Memoire sur le refraction des corps solides, d'Alembert theoretically explained refraction and wrote about what is now called d'Alembert's paradox: that the drag on a body immersed in an inviscid, incompressible fluid is zero. In 1742 d’Alembert began to read Traité de dynamique before the Academy. He improved Isaac Newton’s definition of force and helped resolve a controversy over the conservation of kinetic energy. He also clearly stated his belief that mechanics was a field of mathematics and should be made into a completely rationalistic mathematical system. He regarded Newton’s laws of motion as logical necessities, rather than the outcome of empirical research. In 1747 d’Alembert published an article on vibrating strings which contained the first appearance in print of the wave equation, but his preference for mathematical deduction over actual observation led him to over-simplify certain boundary conditions, so that his conclusions were inaccurate. He pioneered the use of partial differential equations in physics, and won the 1747 prize of the Prussian Academy for Réflexions sur la cause générale des vents. Leonhard Euler (1707-1783), the Swiss mathematician, recognized the strength of d’Alembert’s methods and further developed them. While he made substantial contributions in mathematics and physics, d'Alembert is also famous for incorrectly arguing in Croix ou Pile, one of the articles of the Encyclopédie, that the probability of a coin landing heads increased for every time that it came up tails. In gambling, the strategy of decreasing one's bet the more one wins and increasing one's bet the more one loses is therefore called the D'Alembert system, a type of martingale. d’Alembert, Jean Le Rond and Catherine Kintzler (ed.). Essai sur les éléments de philosophie ou sur les principes des connaissances humaines. Fayard, 1986.
d’Alembert, Jean Le Rond and Richard N. Schwab (trans.). Preliminary Discourse to the Encyclopedia of Diderot. Chicago: University of Chicago Press, 1995. Barni, Jules Romain. Histoire des idées morales et politiques en France au dix-huitième siècle: Tome 2: Jean-Jacques Rousseau. Diderot. D'Alembert. Adamant Media Corporation, 2001. Hankins, Thomas. Jean d'Alembert: Science and the Enlightenment (Classics in the History and Philosophy of Science). Martin Dunitz, 1990. History of "Jean le Rond d'Alembert"
This page was last modified on 1 May 2018, at 20:49.